CDOT has adopted the NACTO Urban Street Design Guide as a standard for street design consistent with Chicago’s complete streets policy. As per the NACTO guide, 55th Street in Hyde Park is at an interm stage of its transformation into a complete street. These interm treatments quickly and inexpensively improved street safety and allowed the complete street design to be evaluated. CDOT summarized community input from the first public meeting in the first 9 slides of the above presentation. Many problems noted in the first meeting overlap with my evaluation of existing conditions and there are a few additional concerns. One concern I disagree with is the request for additional lighting. West of University, the street feels desolate, but additional lighting won’t solve this problem on its own. Activation of the streetscape, preferably through commercial development, and improved of pedestrian connections are required to ‘brighten up’ the street. CDOT has proposed various streetscape treatments in order to activate the street, but I’m doubtful they’ll work as intended in the absence of land use changes. 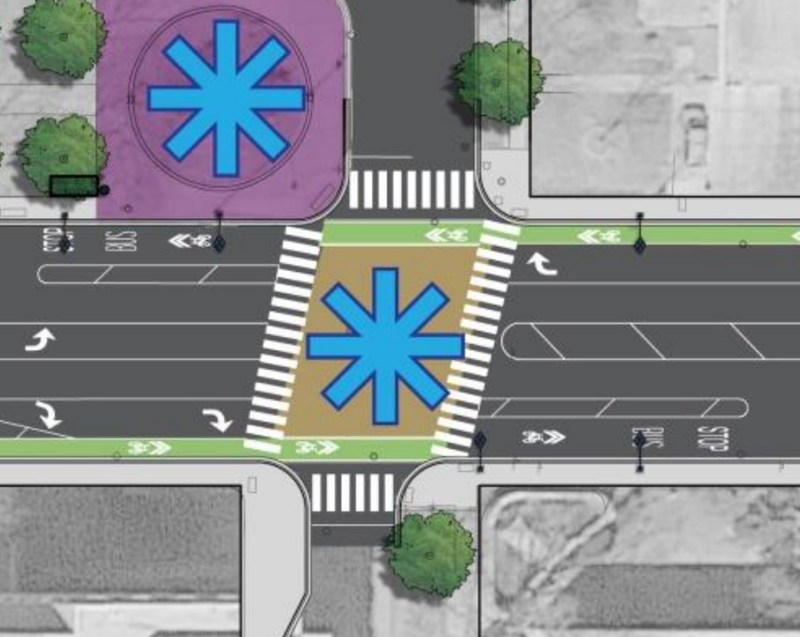 CDOT has proposed many positive changes, but there are areas where the proposed plan lacks imagination or doesn’t fully implement NACTO standards. At intersections, NACTO recommends/requires curb widths to be as narrow as is practical. At 55th and Cottage Grove, it is presently proposed for this intersection to retain it’s excessive curb widths, especially on the north and east legs of the intersection. Narrowing the curb to curb width by 6′ by removing buffers between the traffic lanes, or by removing dedicated right turn lanes would reduce speeding, improve pedestrian crossing experiences, and provide the necessary room to widen the sidewalks. Existing cross-section of 55th Street at Cottage Grove. Proposed 55th Street cross-section at Cottage Grove. At Drexel, Ingleside, and Greenwood, on slides 11 to 15, CDOT proposes changing street treatments. I propose changing the street configuration instead. Reconnecting Drexel and Greenwood to 55th street would improve travel connectivity, reduce speeds on 55th street, and allow the conversion of the frontage road into one-way or laneway operation. The latter should completely restrict speeding cut-through traffic. Effective narrowing of the frontage road can be immediately implemented by striping in reverse angle parking spots and adding one-way signage. These changes would be both cheaper and more effective than the Boulevard Plaza concept. A reduction in the width of the frontage road also gives the city the future option of selling land in the right of way for new development facing the main branch of the street. The intersection design at Cottage Grove and several other intersection designs, do not follow NACTO’s cycletrack intersection approach guidance or dutch practices. These recommend curving the cycletrack either towards or away from through traffic in order to increase the visibility of cyclists before and in the intersection. 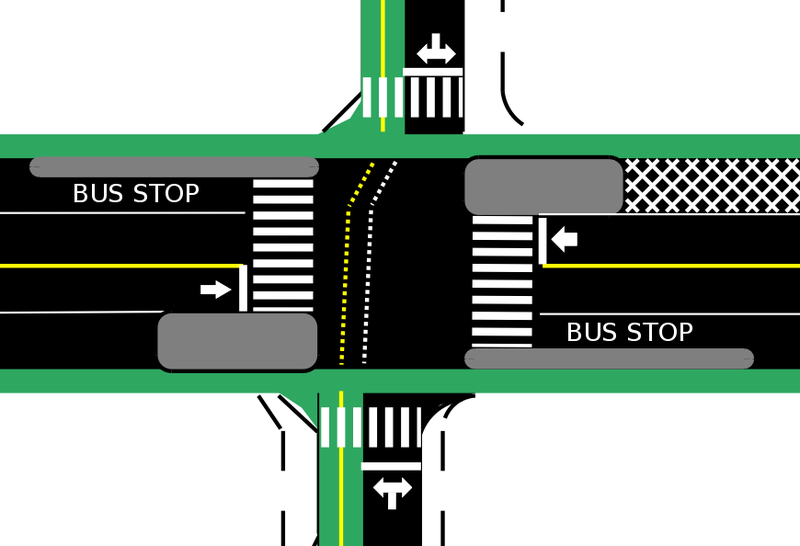 In their present (and proposed) location, the bicycle lanes are in a position between these two options: too close to the traffic lanes to allow cars to sit between the intersection and the bike lane, and too far from the traffic lanes to provide good visibility or to enforce small turning radii. Large effective turning radii encouraging high speed turns are also created by the overabundance of dedicated right-turn lanes off 55th Street; at intersections without permitted right turn signals, these turn lanes need to be removed. At controlled intersections with protected bicycle signal phases, these conflicts do not occur. CDOT is looking into their use. As dedicated phases increase signal cycle time and increase delays for all users, they should be used only when other design elements cannot adequately ensure safety. At 55th St. and University Ave, a new dormitory under construction is expected to increase the already high number of pedestrians crossing 55th Street. CDOT is proposing the installation of decorative cross-walks in order to improve pedestrian visibility. The proposal does nothing to shorten crossing distances, provide refuge. Alternative Design for a signalized intersection at 55th and University. In addition to many pedestrians, a significant number of trucks and buses use the intersection and it’s been identified as a potentially important north-south bicycle crossing of 55th Street. With all these uses, a new traffic signal should be added at the intersection. This signal can be installed in conjunction with the reversal of one-way flow on University and Greenwood so that Greenwood flows away from 55th and University flows toward the new traffic signal on both sides of 55th street. Between Woodlawn and Kenwood, the only substantial change proposed.is the addition of raised end medians, protecting the bike lane and blocking the unofficial 55th Street Bus Lane. To widen the sidewalks, CDOT intends to ask for land in Nichols Park. While I don’t object in principle to taking park land, I do object to unnecessary widening of the right-of-way. There’s already 15 feet worth of buffer in the space that can be reduced in order to expand the sidewalks. The oral presentation mentioned that curb protection for bicycle lanes could not be implemented due to concerns about snow clearance. Specifically, it is unclear who is responsible for clearing the snow off the barrier curb itself. It’s unclear to me why that snow would need to be cleared. If permanent curbs cannot be installed, temporary curbs constructed out of parking stops could be installed. Curb protection is required. Near Cottage Grove, CDOT also mentioned the possibility of using eminent domain to expand the sidewalk. Again this is a poor use of eminent domain when there’s is plenty of space in the right-of-way. Rather, eminent domain would be very well applied in order to obtain an easement across the University Park Condominiums’ property. Before the building was converted into condominiums in 1977, pedestrian access was provided across 55th through the inner courtyard. This access needs to be provided, and this need was strongly affirmed by community members at the second public meeting. A physicist and a mathematician are sitting in a faculty lounge. Suddenly, the coffee machine catches on fire. The physicist grabs a bucket and leap towards the sink, filled the bucket with water and puts out the fire. Second day, the same two sit in the same lounge. Again, the coffee machine catches on fire. This time, the mathematician stands up, gets a bucket, and hands the bucket to the physicist, thus reducing the problem to a previously solved one.. I support CDOT’s proposed consolidation of bus stops on 55th Street. I do not agree with the removal of bus stops at Drexel, but the number of stops between Ellis and Lake Park is excessive. I’d place stops at the near side of Dorchester, the far side of Woodlawn, University, Ellis, and Drexel westbound and at the far side of Drexel, Ellis, University, Woodlawn, Kenwood, and nearside Blackstone eastbound. The Blackstone stop locations is contingent on gaining pedestrian access through University Park Condominiums. This should be combined with moving bus stops inside the bike lanes and raising the curbs to allow level boarding. CDOT’s plan glosses over the corner at Lake Park, despite poor existing design at the intersection. At the meeting, there was a discussion of providing a dedicated left turn lane from northbound Lake Park to westbound 55th Street. This should include a road diet south of 55th to one-lane each way. The north-south bus stops should be moved to the far sides and sidewalk at the northbound bus stop needs to be widened and a crosswalk across the east leg of the intersection should also be added. Curb bulbs could also be added on several corners of the intersection. Given the large number of buses traveling north-south through Hyde Park, a dedicated busway could be very useful if implemented in the existing northbound lanes of Lake Park. East of Lake Park, the addition of addition of bump outs and new tree plantings as proposed are exactly what is required. I’ll ignore the aesthetic options presented in the last few slides. I’d rather save the money. A physicist and a mathematician are sitting in a faculty lounge. Suddenly, the coffee machine catches on fire. The physicist grabs a bucket and leap towards the sink, filled the bucket with water and puts out the fire. Second day, the same two sit in the same lounge. Again, the coffee machine catches on fire. This time, the mathematician stands up, gets a bucket, and hands the bucket to the physicist, thus reducing the problem to a previously solved one. This entry was posted in Automotive, Cycling, Transit, Walking. Bookmark the permalink.